On the client computer, get UCR and unzip it, and install Interception to allow for the use of keyboard inputs. 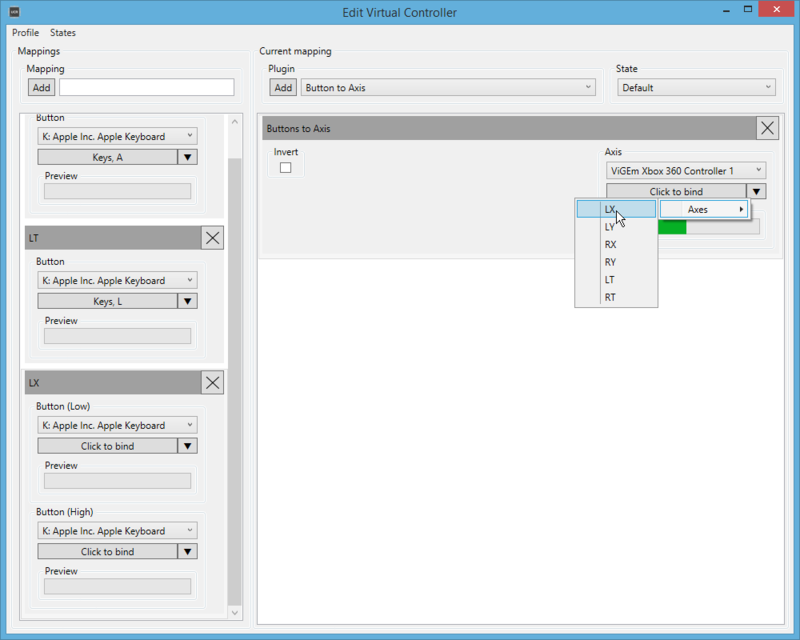 UCR requires ViGEm to emulate Xbox 360 controllers, but you will already have it if you installed Parsec with controller support. Be sure you reboot after installing either Interception or ViGEm. After rebooting, start UCR. If you extracted UCR with Windows's zip extractor, you may be prompted to run it by Microsoft SmartScreen. You will then be prompted by UCR to unblock additional components of UCR, which will require going through SmartScreen again. You may need to restart UCR before any available devices show up in the following step. Using an alternate extractor like 7-zip will avoid this. 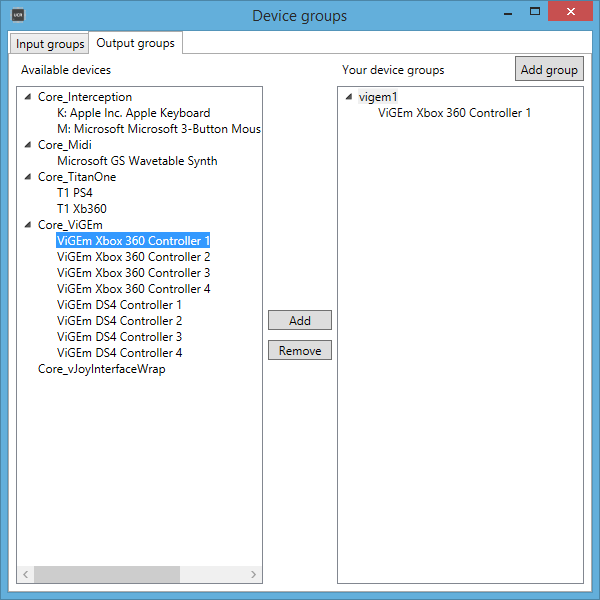 Select Devices > Manage device groups in the menu. 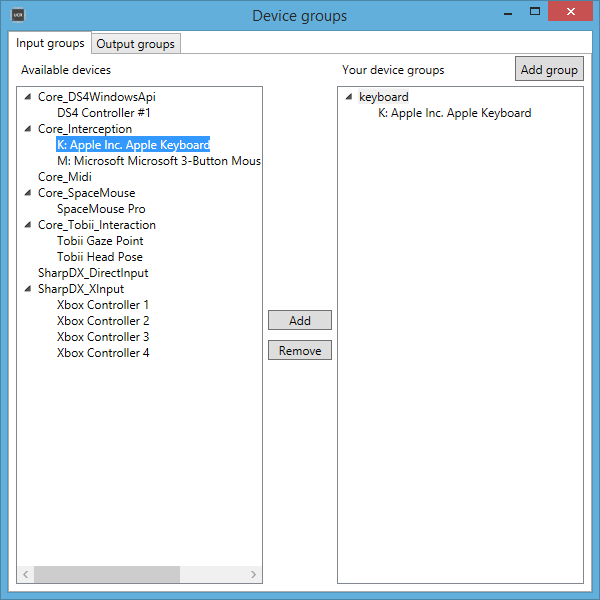 Create an input group and add your keyboard to it from the Core_Interception category. To map a digital button, which includes the DPad, but does not include the triggers (L2 and R2), type a mapping name in the mapping field at the top and click add. then select Button to Button in the plugin dropdown and click add. Click Click to Bind on the left side to press a key to use, or click the arrow next to it to select a key from a menu. On the right, select the button to use from a dropdown. To map the triggers, use the Button to Axis plugin. Map the buttons the same way as with digital inputs, but check the Absolute checkbox. This will ensure that the trigger goes between 0 and 100, not 50 and 100. To map an axis, use the Buttons to Axis plugin. You will need two of these for each joystick, e.g. LX and LY for the left joystick. Bind these the same as digital inputs, except there are two buttons on the keyboard, one for the low part of the axis and one for the high part. Note that as of UCR v0.6.0, low and high seem to be reversed, so be sure to test your bindings to make sure they do what you expect. If you find that your two buttons are the wrong way around, you can check the Invertcheckbox to swap them. To test your mappings, you can select Profile > Activate Profile in the menu and visit the HTML5 Gamepad Tester. You can also see the status of inputs and outputs using the green bars below mappings in UCR. You may need to deactivate and activate the profile to apply new changes. When you are done, close the profile window and select File > Save in UCR's main menu. Changes are not automatically saved. If the ViGEm controllers do not appear as options for output devices, you do not have ViGEm installed. You can install it from here. 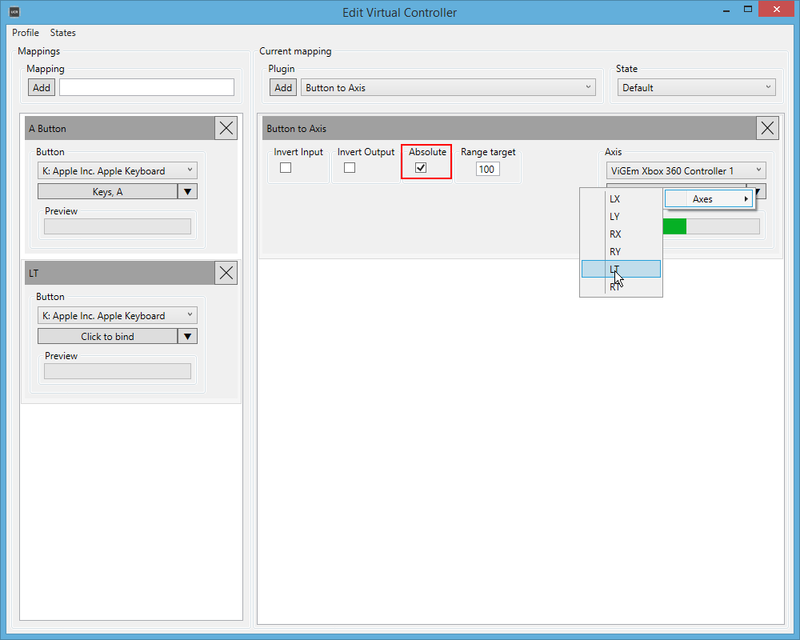 If your virtual controller is not recognized by the host, they are most likely missing the controller driver. You will still be able to use your keyboard normally (unless you block inputs as below), but if you notice extra key presses being added or the mouse being triggered, this is probably caused by Steam controller support. Follow these instructions to disable it. This can happen on either host or client if steam is open.